Wand guard tour systems – Here the software is loaded in handheld devices. Cloud guard tour systems – The technology used here is cloud and the guard tour app is downloaded in the mobile. Educational centers and institutions to ensure the safety of the facilitators and students. Warehouses – To ensure that the merchandise is safe and secure. Security companies – This is a must if they are into the business of managing guard tours. This software also makes it easier for them to generate reports. Cleaning and maintenances services – The guard tour system will ensure that the janitors and other workers are doing their duties correctly. The patrolling officers do not need to carry a log book or note book. All that he has to carry with him is his smartphone or a handheld device, i.es a data reader with him. Use the data reader to scan the check points and you can use the interface to enter the activity. That is all the activities could be monitored real time via a simple mobile device. It reduces the time and eliminates paper work, thereby allowing the officers to focus on other important aspects of work. The scanned data will be stored in secured databases and can be retrieved when needed at anytime and anywhere. The superiors will have the data of each and every security officer they have employed with the click of few keys. The modern guard system needs only a smart phone on which the guard tour application is downloaded. With a few touches on the screen, the data at the various checkpoints can be scanned and sent to the clients and those who are in charge of monitoring the reports in real time. Reports can be generated real time. The activities of the patrolling or security officers will be monitored as well as recorded. By analyzing the data, you can find out the officers who are doing their duties and those who are underperforming. Guard tour systems can trigger alerts and send images and messages when a significant patrolling is missed. Similarly, alerts and SOS messages, images and sound recordings can also be sent to the clients. Real time communication with the security officers. Messages can be sent to a group or it can be one-to-one messages. Last but not the least implementing a reputed guard tour system will help the business monitor whether their officers are reporting on time and also manage the assets better. 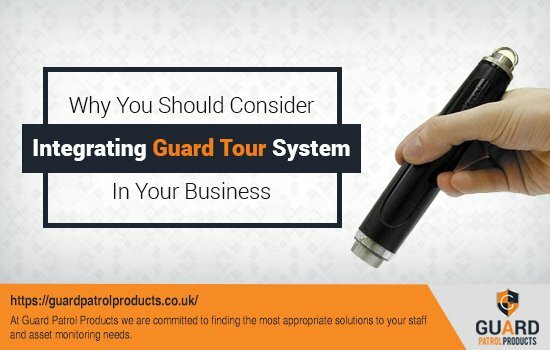 Whatever may be the size of your organization consider implementing a superior guard tour system.